Sugar is one of the most harmful ingredients found in processed foods today. 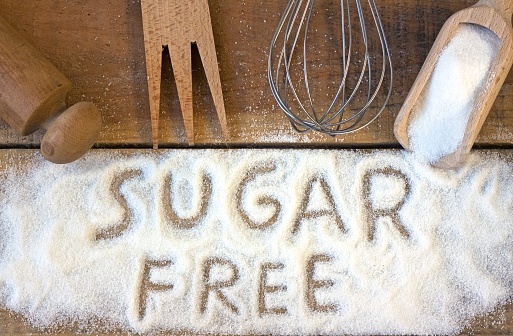 While the list goes on and on as to why you should go “sugar free”, check out my top 10 reasons to “quit” sugar. Sugar contains empty calories that are not giving any nutritional value whatsoever. What a waste! Has been shown to cause mood swings, anxiety, and irritability. As it turns out, sugar is only enjoyable during the 15 minutes that we are consuming it… then party’s over. May slow weight loss. Oh no! High insulin levels can cause extra carbohydrates to be stored as fat instead of being used as fuel. Can lead to diabetes. The pancreas must work harder when sugar is ingested. When the overworked pancreas can no longer keep up, diabetes can occur. Decreased immune system function. Nobody likes being sick! Tooth Decay. Remember when your mom said that eating all that Halloween candy would rot your teeth? Well she was right. Sugar is addictive! Consuming sugar will cause the release of Dopamine in the brain (the feel good hormone). You may find yourself consuming more… and more… and more to get that same “feel good” feeling. Can affect your mental game. Sugar has been shown to cause foggy mindedness. Remember that sugar crash you had after you ate an entire slice of cheesecake? I saw you passed out on the couch. Wow. Can up your risk to cancer! Yes, the dreaded C word. Help your body avoid cancer by keeping your insulin levels normal and avoiding sugar. Sugar just isn’t all that satisfying. It’s true. One may be enjoying it when consumption is happening however, that satiety is short lived. Choosing a natural option like fruit will leave you feeling more full and satisfied than a cookie loaded with sugar.